The Homes for Heroes Grant Foundation has been established as another way to give back to the everyday heroes that serve the public. As a part of the Homes for Heroes organization, the Foundation Grant program was established to continue the circle of giving that Homes for Heroes, formed after the September 11th Terrorist Attacks, gives to everyday heroes with their home purchasing and re-financing needs. Homes for Heroes Affiliates in lending and real estate work with Heroes in finding the right home loan, and the right home. To learn more about our specialists in your area, click here. The Homes for Heroes Foundation presents a grant to a hero recipient every month. The mission of the Homes for Heroes Foundation is to continue to help heroes. 100% of the grant given by the foundation goes to assist heroes. At Homes for Heroes, we believe in thinking nationally and acting locally. The Homes for Heroes grant is awarded to local nonprofits serving our heroes in need. The foundation supports law enforcement, teachers, military and healthcare workers, and firefighters. Nonprofits are nominated by Homes for Heroes inc. affiliates and employees. The Homes for Heroes Foundation recognizes the incredible service that the Aurora Police Association has carried out in the city of Aurora, Colorado. If you would like to make a donation to the Homes for Heroes Foundation and help heroes in dire need – you can do so here. Established in 2015, the Aurora Police Association Charitable Foundation was formed to help support the Aurora Police Department. The mission of the Aurora Police Association Charitable Foundation is to help support underprivileged children, injured police officers, and the children and grandchildren of the Aurora Police Department. The Aurora Police Association Charitable Foundation hosts events in the community of Aurora such as the “Shop with a Cop” event. “Shop with a Cop” was designed to partner Aurora Police Department police officers and public safety employees with disadvantaged children in the community to give them a fun afternoon shopping with one of the many heroes that are patrolling the streets every day. 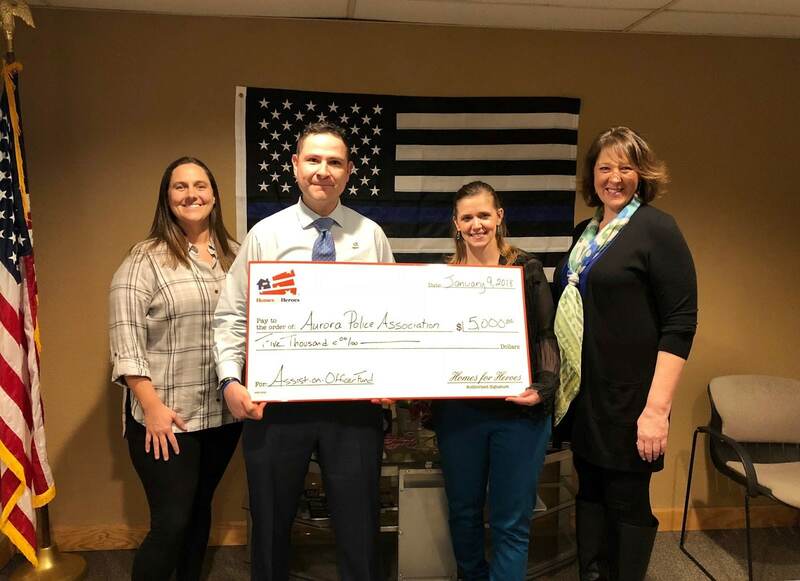 The Assist Officers and Their Families Fund, part of the Aurora Police Association Charitable Foundation, is designed to help injured and fallen officers and their families. The APACF provides support with medical bills to officers injured in the line of duty. The Aurora Police Association Charitable Foundation also has a scholarship fund. The scholarship fund granted scholarship awards in 2017, two years after their establishment. 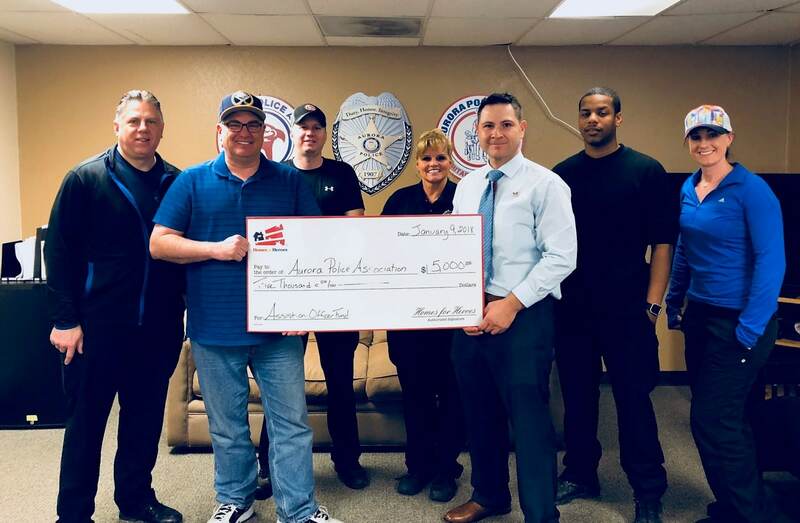 It is with the utmost respect and honor that the Homes for Heroes Foundation presents the Hero Reward grant to the Aurora Police Association Charitable Foundation. The Aurora Police Department, established in 1907, has a long history of service to the city of Aurora, Colorado. Each day the dedicated police officers take to the streets to patrol, provide help and service, and enforce the law, all to keep the citizens of Aurora safe. Each officer takes their safety and lives into their own hands every day. Being a police officer means always being on call, and always stepping in and helping people in the event of an emergency, whether they are on duty or off duty. The Aurora Police Association Charitable Foundation understands and honors that commitment by working alongside the Aurora Police Department. The bravery and sacrifice that the superb officers of the Aurora Police Department offer do not go unnoticed. The Aurora Police Department is one of ten police departments across the state of Colorado accredited by the Commission on Accreditation for Law Enforcement Agencies. The mission of the Aurora Police Department is to make Aurora safer every day. The Aurora Police Department values working with the community, the representatives and school leaders to face the challenges that are unique to a rapidly growing metro area such as Aurora. The Aurora Police Department currently employs 696 sworn police officers, along with 232 career service employees. Each one of the employees is an everyday hero. In 2012, the eyes of the nation were on the city of Aurora and the Aurora Police Department as they responded to one of the largest mass shootings in the country. The Aurora Police Department carried out their mission to protect and serve the people of Aurora in their time of crisis with the utmost courage, bravery, and professionalism. Since the shooting, the Aurora Police Department has worked incredibly hard to make the streets safe and provide a feeling of safety and security for the residents of Aurora. Once known only as a suburb of Denver, and then the setting of a national tragedy, the City of Aurora is now known for its outstanding police department. The Aurora Police Department is committed to working with neighborhood groups, members of the business community, non-profit organizations like Aurora Police Association Charitable Foundation, and with individuals to help make Aurora a safe city to work, play, and live. The Homes for Heroes Foundation is honored to give back to heroes. Awarding grants to charitable organizations that are actively supporting and helping everyday heroes is just one of the many ways that the Homes for Heroes Foundation and Homes for Heroes Inc give back to those that give their all every day. We are honored to be able to give back to heroes.